The Burmese language (Burmese: မြန်မာဘာသာ pronounced:  MLCTS: myanma bhasa) is the official language of Burma. Burmese is the native language of the Bamar and related sub-ethnic groups of the Bamar, as well as that of some ethnic minorities in Burma like the Mon. Burmese is a tonal, pitch-register, and syllable-timed language, largely monosyllabic and analytic language, with a subject–object–verb word order. It is a member of the Lolo-Burmese grouping of the Sino-Tibetan language family. The language uses a Brahmic script called the Burmese script. Burmese belongs to the Southern Burmish branch of the Sino-Tibetan languages. Burmese is the most widely spoken of the non-Sinitic Sino-Tibetan languages. Burmese was the fourth of the Sino-Tibetan languages to develop a writing system, after Chinese characters, the Tibetan alphabet and the Tangut script. The standard dialect of Burmese (the Mandalay-Yangon dialect continuum) comes from the Irrawaddy River valley. 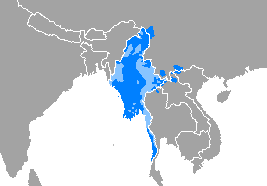 Regional differences between speakers from Upper Burma (e.g., Mandalay dialect), called anya tha အညာသား, and speakers from Lower Burma (e.g., Yangon dialect), called auk tha အောက်သား, occur in vocabulary choice, not in pronunciation. Minor pronunciation differences do exist within the Irrawaddy River valley. For instance, for the term ဆွမ်း "food offering [to a monk]", Lower Burmese speakers use [sʰʊ́ɴ] instead of [sʰwáɴ], which is used in Upper Burma. The standard dialect is represented by the Yangon dialect, because of the city's media influence and economic clout. In the past, the Mandalay dialect represented standard Burmese. The most noticeable feature of the Mandalay dialect is its use of the first person pronoun ကျွန်တော် kya.nau for both males and females, whereas in Yangon, the said pronoun is used only by males, while ကျွန်မ kya.ma. is used by females. Moreover, with regard to kinship terminology, Upper Burmese speakers differentiate the maternal and paternal sides of a family whereas Lower Burmese speakers do not. Spoken Burmese is remarkably uniform among Burmese speakers, particularly those living in the Irrawaddy River valley, who all use variants of Standard Burmese. The first major reason for the uniformity is the traditional Burmese Buddhist monastic education system, which encouraged education and uniformity in language throughout the Upper Irrawaddy valley, the traditional homeland of the Burmans. Secondly, the migration of Burmese speakers (of Bamar descent) to Lower Burma is relatively recent. As late as the mid-1700s, Mon was the principal language of Lower Burma. After the Burmese-speaking Konbaung Dynasty's victory over the Mon-speaking Restored Hanthawaddy Kingdom in 1757, the shift to the Burmese language began throughout Lower Burma. By 1830, an estimated 90% of the population in the region identified themselves as Burman (and as such, Burmese speakers) due the influx of Burmese speakers from Upper Burma, assimilation, and intermarriage. In the British colonial era, British incentives, particularly geared toward rice production, as well as political instability in Upper Burma, accelerated this migration. More distinctive non-standard dialects emerge as one moves farther away from the Irrawaddy River valley toward peripheral areas of the country. These dialects include Yaw, Palaw, Merguese (Myeik), Tavoyan (Dawei), Intha, Danu, Arakanese (Rakhine) and Marma. Despite substantial vocabulary and pronunciation differences, there is mutual intelligibility among most Burmese dialects. The most pronounced feature of the Arakanese (Rakhine) is its retention of the sound, which has become a sound in standard Burmese. Also, Arakanese features a variety of vowel differences, including the merger of the ဧ and ဣ vowels. Hence, a word like "blood" သွေး is pronounced in standard Burmese and in Arakanese. Dialects in Tanintharyi Region, including Palaw, Merguese and Tavoyan, are especially conservative in comparison to Standard Burmese. The Tavoyan and Intha dialects have preserved the /l/ medial, which is otherwise only found in Old Burmese inscriptions. They also often reduce the intensity of the glottal stop. Merguese has 250,000 speakers while Tavoyan has 400,000 speakers. In the mid-1960s, some Burmese writers, who asserted that the vernacular, spoken form ought to be used, spearheaded efforts to abandon the literary form, which was historically the preferred form of written Burmese, as "the spoken style lacks gravity, authority, dignity." Some Burmese linguists such as Minn Latt, a Czech academic, proposed moving away from the high form of Burmese altogether. Although the literary form is heavily used in written contexts (literary and scholarly works, radio news broadcasts, and novels), the recent trend has been to accommodate the spoken form in informal written contexts. Nowadays, television news broadcasts, comics, and commercial publications use the spoken form or a combination of the spoken and simpler, less ornate formal forms. Pali မာန māna → Burmese မာန "arrogance" and မာန် "pride"
Burmese has also adapted a great deal of words from Mon, traditionally spoken by the Mon people, who until recently formed the majority in Lower Burma. Most Mon loanwords are so well assimilated that they are not distinguished as loanwords as Burmese and Mon were used interchangeably for several centuries in pre-colonial Burma. Mon loans are often related to flora, fauna, administration, textiles, foods, boats, crafts, architecture and music. "to sign": ဆိုင်းထိုး ← ဆိုင်း (English, "sign") + ထိုး (native Burmese, "inscribe"). radio: ရေဒီယို , from English "radio"
Since the end of British rule, the Burmese government has attempted to limit usage of Western loans (especially from English) by coining new words (neologisms). For instance, for the word "television," Burmese publications are mandated to use the term ရုပ်မြင်သံကြား (lit. "see picture, hear sound") in lieu of တယ်လီဗီးရှင်, a direct English transliteration. Another example is the word "vehicle", which is officially ယာဉ် (derived from Pali) but ကား (from English "car") in spoken Burmese. Some previously common English loanwords have fallen out of usage with the adoption of neologisms. An example is the word "university", formerly ယူနီဗာစတီ , from English "university", now တက္ကသိုလ် , a Pali-derived neologism recently created by the Burmese government and derived from the Pali spelling of Taxila (တက္ကသီလ Takkasila), an ancient university town in modern-day Pakistan. Some words in Burmese may have many synonyms, each having certain usages, such as formal, literary, colloquial, and poetic. One example is the word "moon", which can be လ la̰ Tibeto-Burman), စန္ဒာ/စန်း (derivatives of Pali canda "moon"), or သော်တာ (Sanskrit). ^1 /ð/ is uncommon, except as a voiced allophone of /θ/. ^2 /w̥/ is rare, having disappeared from modern Burmese, except in transcriptions of foreign names and a handful of native words. ^3 /ɹ/ is rare, used only in place names that have retained Sanskrit or Pali pronunciations (e.g. Amarapura, pronounced and in English-derived words. Historically, /ɹ/ became /j/ in Burmese, and is usually replaced by /j/ in Pāli loanwords, e.g. "monk" ရဟန္တာ ra.hanta , "king" ရာဇ raja. . Occasionally it is replaced with /l/ (e.g., "animal" တိရစ္ဆာန် ti.rac hcan), pronounced or . e.g. "blouse" (အင်္ကျီ angkyi): → . Becker, Alton L. (1984). "Biography of a sentence: A Burmese proverb". In E. M. Bruner (ed.). Text, play, and story: The construction and reconstruction of self and society. Washington, D.C.: American Ethnological Society. pp. 135–55. Bernot, Denise (1980). Le prédicat en birman parlé (in French). Paris: SELAF. Green, Antony D. (2005). "Word, foot, and syllable structure in Burmese". In J. Watkins (ed.). Studies in Burmese linguistics. Canberra: Pacific Linguistics. pp. 1–25. Okell, John (1969). A reference grammar of colloquial Burmese. London: Oxford University Press. Roop, D. Haigh (1972). An introduction to the Burmese writing system. New Haven: Yale University Press. Watkins, Justin W. (2001). "Illustrations of the IPA: Burmese". Journal of the International Phonetic Association 31 (2): 291–95. Patricia M Herbert, Anthony Milner, ed. (1989). South East Asia Languages and Literatures: Languages and Literatures: A Select Guide. Julie D. Allen et al, ed. (April 2012). "11. Southeast Asian Scripts". The Unicode Standard Version 6.1 – Core Specification. Mountain View, CA: The Unicode Consortium. pp. 368–373. Aung-Thwin, Michael (2005). The Mists of Rāmañña: The Legend that was Lower Burma (illustrated ed.). Honolulu: University of Hawai'i Press. Aung Bala (1981). "Contemporary Burmese literature". Contributions to Asian Studies 16. Barron, Sandy; Okell, John; Yin, Saw Myat; VanBik, Kenneth; Swain, Arthur; Larkin, Emma; Allott, Anna J.; Ewers, Kirsten (2007). ﻿Refugees from Burma: Their Backgrounds and Refugee Experiences﻿ (Report). Center for Applied Linguistics. http://www.cal.org/co/pdffiles/refugeesfromburma.pdf. Retrieved 2010-08-20. Benedict, Paul K. (Oct–Dec 1948). "Tonal Systems in Southeast Asia". Journal of the American Oriental Society (American Oriental Society) 68 (4). Bradley, David (Spring 1993). 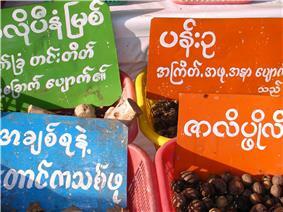 "Pronouns in Burmese–Lolo". Linguistics of the Tibeto-Burman area (Melbourne: La Trobe University) 16 (1). Bradley, David (2006). Ulrich Ammon, Norbert Dittmar, Klaus J. Mattheier, Peter Trudgill, ed. Sociolinguistics / Soziolinguistik 3. Walter de Gruyter. Bradley, David (1996). Atlas of Languages of Intercultural Communication in the Pacific, Asia, and the Americas 1. Walter de Gruyter. Bradley, David (1989). "Uncles and Aunts: Burmese Kinship and Gender". South-east Asian Linguisitics: Essays in Honour of Eugénie J.A. Henderson (School of Oriental and African Studies, University of London): 147–162. Bradley, David (2010). "9. Burma, Thailand, Cambodia, Laos and Vietnam". In Martin J. Ball. The Routledge Handbook of Sociolinguistics Around the World. Routledge. pp. 98–99. Bradley, David (1995). "Reflexives in Burmese". Papers in Southeast Asian Linguistics No. 13: studies in Burmese languages (Australian National University) (A-83): 139–172. Bradley, David (2012). "The Characteristics of the Burmic Family of Tibeto-Burman". Language and Linguistics 13 (1): 171–192. Chang, Charles B. (2009). "English loanword adaptation in Burmese". Journal of the Southeast Asian Linguistics Society 1: 77–94. Herbert, Patricia M.; Milner, Anthony (1989). South-East Asia Languages and Literatures: A Select Guide. University of Hawaii Press. Hill, Nathan W. (2012). "Evolution of the Burmese Vowel System". Transactions of the Philological Society 110 (1): 64–79. Hnin Tun; San San (2001). Burmese Phrasebook. Vicky Bowman. Lonely Planet. Jones, Robert (1986). McCoy, John; Light, Timothy, eds. Pitch register languages. Contributions to Sino-Tibetan Studies (E. J. Brill). Khin Min, Maung (1987). "Old Usage Styles of Myanmar Script". Myanmar Unicode & NLP Research Center. Retrieved 2008-07-29. Lieberman, Victor B. (2003). Strange Parallels: Southeast Asia in Global Context, c. 800–1830, volume 1, Integration on the Mainland. Cambridge University Press. Nishi, Yoshio (30 October 1998). "The Development of Voicing Rules in Standard Burmese". Bulletin of the National Museum of Ethnology (国立民族学博物館) 23 (1): 253–260. Nishi, Yoshio (31 March 1998). "The Orthographic Standardization of Burmese: Linguistic and Sociolinguistic Speculations". Bulletin of the National Museum of Ethnology (国立民族学博物館) 22: 975–999. Okell, John (2002). Burmese By Ear or Essential Myanmar. London: The School of Oriental and African Studies, University of London. Myanmar–English Dictionary. Myanmar Language Commission. 1993. Discourse Marking in Burmese and English: A Corpus-Based Approach (Thesis). University of Nottingham. 2006. Taylor, L. F. (1920). "On the tones of certain languages of Burma". Bulletin of the School of Oriental Studies (Cambridge University Press) 1 (4). Wheatley, Julian; Tun, San San Hnin (1999). "Languages in contact: The case of English and Burmese". The Journal of Burma Studies 4. Wheatley, Julian (2013). "12. Burmese". In Randy J. LaPolla, Graham Thurgood. Sino-Tibetan Languages. Routledge. Aung Zaw (September 2010). "Tell the World the Truth". The Irrawaddy (Chiang Mai) 18 (9). Wheatley, Julian K. (1987). "Burmese". In B. Comrie (ed.). Handbook of the world's major languages. Oxford: Oxford University Press. pp. 834–54. Yanson, Rudolf A. (2012). Nathan Hill, ed. Aspiration in the Burmese Phonological System: A Diachronic Account. Medieval Tibeto-Burman Languages IV. BRILL. pp. 17–29. Yanson, Rudolf (1994). "3. Language". In Uta Gärtner, Jens Lorenz. Tradition and Modernity in Myanmar. LIT Verlag Münster. pp. 366–426. ^ Nordhoff, Sebastian; Hammarström, Harald; Forkel, Robert; Haspelmath, Martin, eds. (2013). "Southern Burmish". Glottolog 2.2. Leipzig: Max Planck Institute for Evolutionary Anthropology. ^ မြန်မာ mranma can be pronounced or, more colloquially, ဗမာ . ^ According to the 1891 British census conducted five years after the annexation of the entire country, Konbaung Burma had an "unusually high male literacy" rate where 62.5% of age 25 and over in Upper Burma could read and write. The figure would have been much higher if non-Burmans (e.g., Chins, Kachins, etc.) were excluded. For the whole country, the literacy rate was 49% for males and 5.5% for females. ^ a b Nishi 30 October 1998, p. 253-260. ^ Yanson 2012, p. 17. ^ Taw 1924, p. viii. ^ From Burmese သခင်ဘုရား, lit. "lord master"
The Burmese script can be entered from the standard QWERTY keyboard. The most popular Burmese font, Zawgyi, is not Unicode-compliant though a number of Unicode-compliant fonts are available. The national standard keyboard layout for Unicode-compliant font shown here. It is known as the Myanmar3 layout as it was published along with the Myanmar3 Unicode font. The layout, developed by the Myanmar NLP Research Center, has a smart input system to cover the complex structures of Burmese and related scripts. Transcription of Burmese is not standardized, as seen in the varying English transcriptions of Burmese names. For instance, a Burmese personal name like ဝင်း may be variously romanized as Win, Winn, Wyn, or Wynn, while ခိုင် may be romanized as Khaing, Khine, or Khain. There is no official romanization system for Burmese. There have been attempts to make one, but none have been successful. Replicating Burmese sounds in the Latin script is complicated. There is a Pāli-based transcription system in existence, MLC Transcription System, which was devised by the Myanmar Language Commission (MLC). However, it only transcribes sounds in formal Burmese and is based on the orthography rather than the phonology. Some nouns are also reduplicated to indicate plurality. For instance, ပြည် "country", but when reduplicated to အပြည်ပြည် "country", means "many countries," as in အပြည်ပြည်ဆိုင်ရာ "international". Another example is အမျိုး, which means "a kind," but the reduplicated form အမျိုးမျိုး means "multiple kinds." Reduplication is prevalent in Burmese and is used to intensify or weaken adjectives' meanings. For example, ချော "beautiful" is reduplicated, the intensity of the adjective's meaning increases. Many Burmese words, especially adjectives with two syllables, such as လှပ "beautiful", when reduplicated (လှပ → လှလှပပ ) become adverbs. This is also true of some Burmese verbs and nouns (e.g. ခဏ "a moment" → ခဏခဏ "frequently", which become adverbs when reduplicated. The contraction also occurs in some low toned nouns, making them possessive nouns (e.g. အမေ့ or မြန်မာ့, "mother's" and "Burma's" respectively). ငါ "I" + ရဲ့ (postpositional marker for possessive case) = ငါ့ "my"
နင် "you" + ရဲ့ (postpositional marker for possessive case) = နင့် "your"
သူ "he, she" + ရဲ့ (postpositional marker for possessive case) = သူ့ "his, her"
† The particle ma. မ is suffixed for females. ‡ Typically reserved for the chief monk of a monastery. When speaking to a person of the same status or of younger age, ငါ nga "I/me" and နင် nang "you" may be used, although most speakers choose to use third person pronouns. For example, an older person may use ဒေါ်လေး dau le: "aunt" or ဦးလေး u: lei: "uncle" to refer to himself, while a younger person may use either သား sa: "son" or သမီး sa.mi: "daughter". Polite pronouns are used to address elders, teachers and strangers, through the use of feudal-era third person pronouns in lieu of first and second person pronouns. In such situations, one refers to oneself in third person: ကျွန်တော် kya. nau for males, and ကျွန်မ kya. ma. for females, both meaning "your servant" and refer to the addressee as မင်း min "your highness", ခင်ဗျား khang bya: "master, lord" or ရှင် hrang "ruler/master". So ingrained are these terms in the daily polite speech that people use them as the first and second person pronouns without giving a second thought to the root meaning of these pronouns. Subject pronouns begin sentences, though the subject is generally omitted in the imperative forms and in conversation. Grammatically speaking, subject marker particles က in colloquial, သည် in formal) must be attached to the subject pronoun, although they are also generally omitted in conversation. Object pronouns must have an object marker particle ကို in colloquial, အား in formal) attached immediately after the pronoun. Proper nouns are often substituted for pronouns. One's status in relation to the audience determines the pronouns used, with certain pronouns used for different audiences. Some particles modify the word's part of speech. Among the most prominent of these is the particle အ , which is prefixed to verbs and adjectives to form nouns or adverbs. For instance, the word ဝင် means "to enter," but combined with အ, it means "entrance" အဝင်. Also, in colloquial Burmese, there is a tendency to omit the second အ in words that follow the pattern အ + noun/adverb + အ + noun/adverb, like အဆောက်အအုံ, which is pronounced and formally pronounced . The Burmese language makes prominent usage of particles (called ပစ္စည်း in Burmese), which are untranslatable words that are suffixed or prefixed to words to indicate level of respect, grammatical tense, or mood. According to the Myanmar–English Dictionary (1993), there are 449 particles in the Burmese language. For example, စမ်း is a grammatical particle used to indicate the imperative mood. While လုပ်ပါ ("work" + particle indicating politeness) does not indicate the imperative, လုပ်စမ်းပါ ("work" + particle indicating imperative mood + particle indicating politeness) does. Particles may be combined in some cases, especially those modifying verbs. စု cu. for groups Can be . Like its neighboring languages such as Thai, Bengali, and Chinese, Burmese uses numerical classifiers (also called measure words) when nouns are counted or quantified. This approximately equates to English expressions such as "two slices of bread" or "a cup of coffee". Classifiers are required when counting nouns, so ကလေး ၅ hka.le: nga: (lit. "child five") is ungrammatical, because the measure word for people ယောက် yauk needs to suffix the numeral. ကြောင်ထီး kraung hti: "male cat"
ကြောင်မ kraung ma. "female cat"
ထန်းဖို htan: hpui "male toddy palm plant"
မစားဘူး ma.ca: bhu: "[I] don't eat"
Verbs are negated by the particle မ ma. , which is prefixed to the verb. Generally speaking, other particles are suffixed to that verb, along with မ. စားတော့ ca: tau. "Eat (now)"
စားတော့မယ် ca: tau. mai "I'm going to eat (straight-away)"
The particle တော့ tau. is used when the action is about to be performed immediately when used in conjunction with မယ်. Therefore it could be termed as the "immediate future tense particle". စားမယ် ca: mai "I will eat"
(စ)စားပြီ (ca.) ca: pri "I am (now) eating"
စားနေတယ် ca: ne tai "I am eating"
The particle နေ ne is used to denote an action in progression. It is equivalent to the English '-ing'"
စားခဲ့တယ် ca: hkai. tai "I ate"
စားတယ် ca: tai "I eat"
The most commonly used verb particles and their usage are shown below with an example verb root စား ca: "to eat". Alone, the statement စား is imperative. The roots of Burmese verbs are almost always suffixed with at least one particle which conveys such information as tense, intention, politeness, mood, etc. Many of these particles also have formal/literary and colloquial equivalents. In fact, the only time in which no particle is attached to a verb is in imperative commands. However, Burmese verbs are not conjugated in the same way as most European languages; the root of the Burmese verb always remains unchanged and does not have to agree with the subject in person, number or gender. Comparatives are usually ordered: X + ထက်ပို htak pui + adjective, where X is the object being compared to. Superlatives are indicated with the prefix အ a. + adjective + ဆုံး hcum: . Adjectives may also form a compound with the noun (e.g. လူချော lu hkyau: "person" + "be beautiful"). The basic word order of the Burmese language is subject-object-verb. Pronouns in Burmese vary according to the gender and status of the audience. Burmese is monosyllabic (i.e., every word is a root to which a particle but not another word may be prefixed). Sentence structure determines syntactical relations and verbs are not conjugated. Instead they have particles suffixed to them. For example, the verb "to eat," စား ca: is itself unchanged when modified. Written Burmese dates to the early Pagan period. The British colonial period scholars believed that the Burmese script was developed c. 1058 from the Mon script. However, evidence shows that the Burmese script has been in use at least since 1035 CE (perhaps as early as 984 CE) while the earliest Burma Mon script, which is different from the Thailand Mon script, dates to 1093 CE. The Burmese script may have been sourced from the Pyu script. (Both Mon and Pyu scripts are derivatives of the Brāhmī script.) Burmese orthography originally followed a square format but the cursive format took hold from the 17th century when popular writing led to the wider use of palm leaves and folded paper known as parabaiks ပုရပိုက်. Much of the orthography in written Burmese today can be traced back to Middle Burmese. Standardized tone marking was not achieved until the 18th century. From the 19th century onward, orthographers created spellers to reform Burmese spelling, because ambiguities arose over spelling sounds that had been merged. During colonial rule under the British, Burmese spelling was standardized through dictionaries and spellers. The latest spelling authority, named the Myanma Salonpaung Thatpon Kyan မြန်မာ စာလုံးပေါင်း သတ်ပုံ ကျမ်း, was compiled in 1978 at the request of the Burmese government. The Burmese alphabet consists of 33 letters and 12 vowels, and is written from left to right. It requires no spaces between words, although modern writing usually contains spaces after each clause to enhance readability. Characterized by its circular letters and diacritics, the script is an abugida, with all letters having an inherent vowel အ a. or . The consonants are arranged into six consonant groups (called ဝဂ် based on articulation, like other Brahmi scripts. Tone markings and vowel modifications are written as diacritics placed to the left, right, top, and bottom of letters. The close vowels /i/ and /u/ and the close portions of the diphthongs are slightly centered to [ɪ] and [ʊ] in closed syllables, i.e. before /ɴ/ and /ʔ/. Thus နှစ် /n̥iʔ/ "two" is phonetically [n̥ɪʔ] and ကြောင် /tɕàuɴ/ "cat" is phonetically [tɕàʊɴ].